Contemporary civil libertarians claim that their works preserve a worthy American tradition of defending free-speech rights dating back to the framing of the First Amendment. Transforming Free Speech challenges the worthiness, and indeed the very existence of one uninterrupted libertarian tradition. 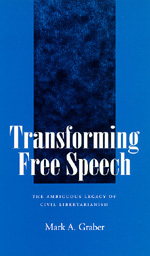 Mark A. Graber asserts that in the past, broader political visions inspired libertarian interpretations of the First Amendment. In reexamining the philosophical and jurisprudential foundations of the defense of expression rights from the Civil War to the present, he exposes the monolithic free-speech tradition as a myth. Instead of one conception of the system of free expression, two emerge: the conservative libertarian tradition that dominated discourse from the Civil War until World War I, and the civil libertarian tradition that dominates later twentieth-century argument. The essence of the current perception of the American free-speech tradition derives from the writings of Zechariah Chafee, Jr. (1885-1957), the progressive jurist most responsible for the modern interpretation of the First Amendment. His interpretation, however, deliberately obscured earlier libertarian arguments linking liberty of speech with liberty of property. Moreover, Chafee stunted the development of a more radical interpretation of expression rights that would give citizens the resources and independence necessary for the effective exercise of free speech. Instead, Chafee maintained that the right to political and social commentary could be protected independent of material inequalities that might restrict access to the marketplace of ideas. His influence enfeebled expression rights in a world where their exercise depends increasingly on economic power. Untangling the libertarian legacy, Graber points out the disjunction in the libertarian tradition to show that free-speech rights, having once been transformed, can be transformed again. Well-conceived and original in perspective, Transforming Free Speech will interest political theorists, students of government, and anyone interested in the origins of the free-speech tradition in the United States. Mark A. Graber is Assistant Professor of Government at the University of Texas, Austin.